Looking for a delicious, easy and healthy dinner idea? The Seattle Times published a recipe on Wednesday, April 11th that caught my attention. I love dinners that can be cooked in the oven; no watching over a hot cooktop and minimal cleanup. When the recipe is built around salmon, onions, herbs and citrus, it is even better. Along with the salmon, I served fresh asparagus and brown rice. 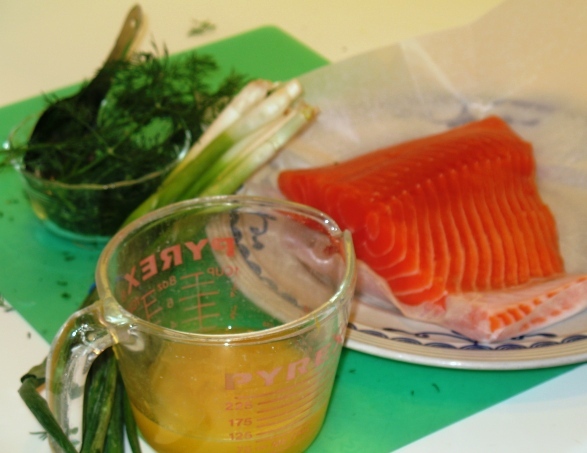 The orange juice and green onions in the sauce added an interesting taste and highlighted the rich flavor of the wild King salmon. This is definitely a recipe I intend to serve again. I am thnking about how to adapt it for halibut!